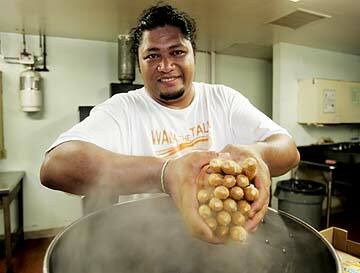 Volunteers cook for the residents at the Next Step homeless shelter in Kakaako. The residents get a meal every night, which makes it a large job to find people who can cook daily. Utu Langi, above, started his day yesterday by cooking more than 300 hot dogs at the First United Methodist Church at 1020 S. Beretania St. STANDING in a hot kitchen, Utu Langi used a wooden ladle the size of a baseball bat to stir a 15-gallon vat of chicken soup filled with 80 pounds of fresh chicken, vegetables and potatoes. Another 5-gallon vat held the rest of the chicken, while 40 pounds of rice steamed in two rice cookers. The sweaty ritual happens almost daily in the First United Methodist Church's kitchen on South Beretania Street, where volunteers prepare food for up to 300 people at the Next Step shelter in Kakaako. Anyone interested in providing meals at the Next Step shelter in Kakaako can contact Ronette Byers at 924-4495 or Michael McNulty at 223-5176. Organizers who provide the meal for the residents say they need more help to feed the homeless. "I'm hoping more churches (and organizations) step up to the plate," said Langi, the supervisor of the Next Step shelter. "I cannot do it alone, the state cannot do it alone. It's going to take a collaborative effort to make this happen." Already local organizations are stepping up to help at Next Step, which has become a hub for local organizations wanting to provide meals for the homeless. At least 23 organizations or individuals have provided meals at the shelter since it opened in May, according to the shelter's meals coordinator, Ronette Kiaaina Byers . Henry Pang, a volunteer at the Co-Cathedral of St. Theresa in Kalihi, said his church's social ministry wanted to expand beyond helping at hospitals and other voluntary services. "We wanted to do something; we just didn't know what to do," said Pang, program coordinator for meals for the homeless at St. Theresa. Now the church provides one meal a month at the shelter. "Everybody seems to agree it's a good mission for us," Pang said. The state pays the group Hawaii Helping the Hungry Have Hope, or H5, for maintenance, security and cleaning of the shelter, but not for meals, Langi, who founded the group 10 years ago, said. The nightly meals are an extra service of his group. Before operating the shelter, H5 fed the homeless at six places around the island, and the group continues that effort. Every morning, they prepare food to distribute outside the shelter. And in the afternoon and evening, if needed, they stay late and prepare another meal for the people staying at the shelter. "It's a challenge. It's a good challenge. So far we've been fortunate," Langi said. Central Union Church is one of the groups that serves meals once a month at the shelter. The church budgets $3 per person per meal for at least 200 people since not everyone shows up, said the Rev. Dean Vestal . The Maikai Loa Christian Academy of the New Anointing Christian Fellowship in Waipahu used the experience as a learning experience. "It was very good for our students; they were really blessed too," said Yvonne Knock , school administrator of the academy. "One student talked about how blessed he was and how much joy it brought to him." The students raised funds to purchase Zippy's chili and prepared salads and dessert that they served. "We've been looking as we go along for opportunities where we might be a blessing to the community," she said, adding that they plan to return. Byers, the shelter meals coordinator for Kakaako, said groups have been generous, but filling the openings is still difficult. Part of the challenge stems from a state requirement that meals need to be prepared in a state-certified kitchen. Some volunteers dropped out after the state required the use of certified kitchens in June, she said. Dallas Carter , the young adult coordinator at Our Lady of Good Counsel Church, said they buy food from a Chinese restaurant in Aiea to take to the shelter. "It's a lot more expensive to do that. However, it keeps us from having to deal with the state runaround," Carter said. Pang said St. Theresa collaborates with the Vietnamese Holy Martyrs Church, which shares the cathedral, to provide meals once a month. "It's a rewarding experience for us, and we think we're doing something to help people in need," Pang said.